Mahonia (Mahonia spp. ): growing, planting, caring. Mahogany is a kind of shrub that blooms abundantly in the winter with shinny leaves - even colored for some species. What more ? They smell good! Scientific name : Mahonia spp. The mahonias are persistent shrubs of which one can cross one of the species in the forests, Mahonia aquifolia. They are therefore well suited to temperate climates and moderately harsh winters. The mahonias bear thorny leaflets that resemble those of holly. In fact, they are alternate leaves with pinnate leaflets, which reach 50 centimeters in length. The mahonias bloom during the winter in candles of yellow flowers very fragrant. Depending on the species, these shrubs reach 0.6 to 3 meters, are more or less floriferous, and its more or less sensitive to frost. Fertilization of mahonias is possible on small-scale species. Mahonias are undergrowth shrubs, so they prefer this type of situation. Plant from late autumn to early spring, in shade or partial shade, in drained soil. Make a hole twice as large as the root ball, without mixing the layers of soil - you will put them back in order at planting. 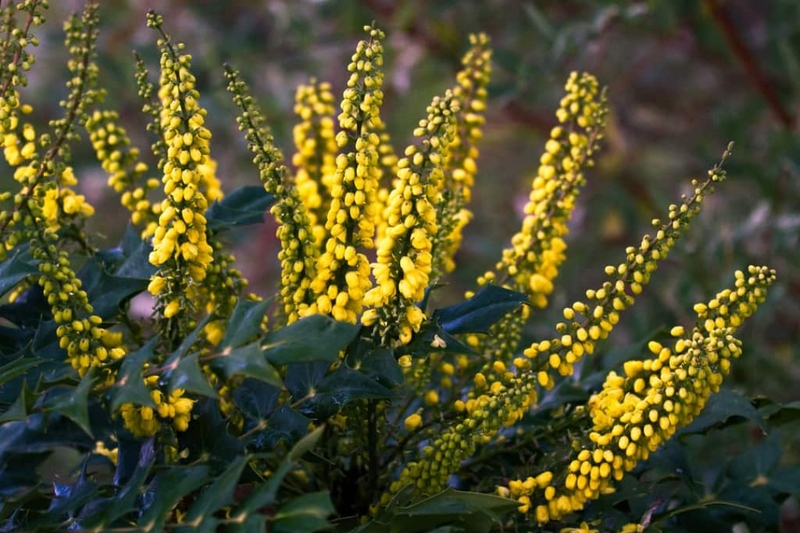 Put back some of the earth from the bottom, and place your mahonia at the right depth. Do not bury the base of the trunks, and fill with the rest of the soil while tamping regularly around the roots. Form a "bowl" of earth around the plant and water until the water no longer flows visibly. In a tank, choose a small-growing species and plant in a mix of loam and compost on a bed of gravel. The trimming of mahonias must be light, it is only intended to lighten them slightly. It should be done after flowering, as early as March. In the early years, trim the tips of stems to force them to branch - and densify the shrub. Then, once your mahonia adult, conversely you will only trim the branches that overlap, those that are damaged, and possibly dry flowers.